Duplication in supply chain activities – With systems set up at a departmental level, there is often duplication of effort while carrying out content operations such as transcoding, localization etc. Restricted Interoperability – Users across departments or units are unable to collaborate effectively since content can only be accessed, shared and processed locally in a limited fashion. Lack of economies of scale – Cost of using local infrastructure is higher compared to the cost of using centralized infrastructure for storage, archival, transcode farms etc. Longer Turnaround Time (TAT) – Lack of ability to re-use assets conveniently and leverage existing workflows for content operations across different platforms leads to delays in delivery. For most M&E regulatory bodies, preservation and transformation of content are equal priorities. For performing this effectively, it is imperative that all assets are discoverable and future proof, and that collaboration among different stakeholders is seamless. A Hybrid Cloud-enabled Media ERP solution makes this possible by centralizing content operations and providing ONE software across the enterprise. Such a solution brings all internal and external stakeholders on to the same system, provides role-based access and allows effective collaboration among different departments and 3rd party vendors across the content lifecycle. A Cloud solution like that can help bring all public broadcasters, radio stations, AV archives etc. under a single umbrella, creating a connected ecosystem for the said regulatory body. The first, and most key step towards realizing this vision would be setting up a common digital archive. All legacy and concurrent videos, audio and images would be digitized and managed through the Media ERP solution. All content would be replicated in a fully secure, easy-to-access Cloud environment, with a second copy in a different Disaster Recovery (DR) location. The solution will include a set of workflows to run both linear (channel operations, programming and compliance reviews, playout) and non-linear operations (OTT publish, social media, screening of awards and international events). Apart from these, specific workflows for content preparation such as digitization, localization etc., can be executed and monitored centrally on a single system. This will foster greater collaboration and transparency for all decision-makers, leading to agility, faster time-to-market and increased monetization. Stringent provisions will be made to control permissions according to users, departments and entities; hence ensuring secure and controlled access to both content and workflows. Agile Media Asset Management (MAM) – Centralized digital asset repository of videos, images, graphics, text, and audio files, pre-integrated with scheduling and rights management applications. 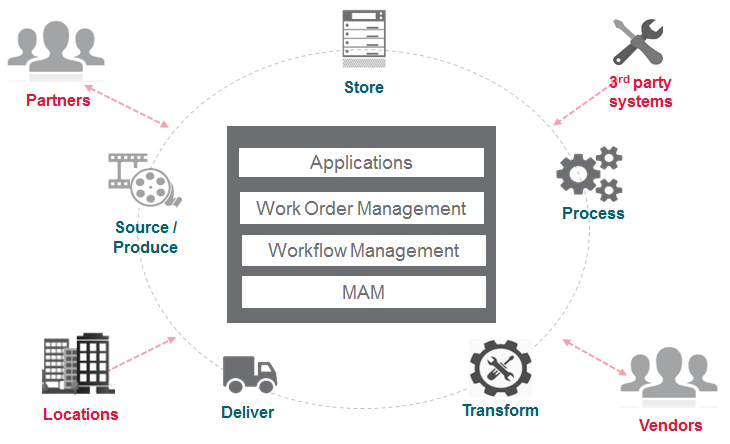 Workflow Management – In-built Business Process Management (BPM) engine to create, execute and monitor workflows across the media supply chain. Work Order Management – Ability to create and track every work request through completion, including all its associated processes, tasks and deliverables. Additionally, Resource and Task Assignment modules enable the assignment of manual tasks to best-fit resources based on skill, availability and cost. Users can assign tasks across their pool of internal, vendor and freelance resources, thus ensuring optimal resource utilization in alignment with business objectives. Applications – The solution will offer end users a wide choice of modern media workflow tools based on latest application releases and upgrades. It will cater to specific functionalities such as review and approval, compliance, cataloging, cloud-based editing and others. The diagram below reflects how the proposed solution virtualizes the content supply chain for M&E regulatory bodies and provides end-to-end workflow orchestration right from content production, storage and archival, to transformation and distribution across multiple stakeholders and 3rd party infrastructure. A pre-requisite for the rollout of this solution is a robust infrastructure backbone. We call this ‘Media Net’, an integrated network spanning across all departments and entities under the regulatory body. Media Net will wire them up through fast leased lines to create an information super-highway. Through this information super-highway, the Cloud solution will exchange media and metadata to orchestrate workflows and enable seamless collaboration among entities and user groups. Various centers can be linked through a hub and spoke model, where the center hubs, typically Regional Headquarters, form the core backbone and are linked to each other through redundant, dedicated links. Each of these Regional Headquarters will in turn be linked to a network of regional operating centers through redundant point-to-point links. Standardization of Business and Supply Chain Processes - On the back of a BPMN 2.0 compliant workflow engine, a common template will be designed for all entities of the regulatory body for media supply chain processes, which incorporates best practices, (like premise agnostic collaboration), and A Cloud solution like that can help bring all public broadcasters, radio stations, AV archives etc. under a single umbrella, creating a connected ecosystem for the said regulatory body. Economies of Scale through ONE Digital Archive – A Hybrid-cloud enabled Media ERP solution will enable regulatory bodies to create ONE Digital Archive, and leverage ONE software to manage media assets and workflows across broadcast, film and AV agencies. Separate infrastructure in terms of storage and applications can be centralized with DR options in place. This will eliminate pockets of inefficiencies created by redundant and duplicate infrastructure. Such initiatives will help regulatory bodies to rationalize the operating cost structure and bring full asset inventory under centralized management, leading to greater creative control and transparency. Efficient collaboration with internal entities and supply chain partners on ONE system - The solution provides specific applications to help users manage content operations such as review and approval, localization, content preparation, promos and content delivery, with in-built dashboards that provide a single view of operations. Automation driven efficiencies and reduction of manual effort - Since all the content is managed on a single system, it can be shared across multiple entities in rule-based automated fashion minimizing manual intervention. For e.g. a movie produced by one entity can be made accessible to a broadcaster for playout. This can be extended to multiple content types, as Media ERP solutions offer comprehensive support for video, audio, posters, images, documents etc. Hybrid Cloud architecture that drives Lowest Total Cost of Operations (TCOP) - The solution’s Hybrid Cloud architecture and distributed workflows provides regulatory bodies with immense flexibility to manage global content operations using ONE application instance which ensures lowest TCOP. It will allow users to leverage a premise-agnostic model, irrespective of the physical location of content. Today, digital transformation is a critical ingredient for the recipe of success across every vertical of the M&E industry. A Cloud-based Media ERP solution can help M&E regulatory bodies to share, create, reuse, disseminate, automate, monetize and transform media supply chain operations. It has immense potential to tear down the silos that impede productivity at an enterprise level, within departments, across content supply chains and geographies, while powering enhanced efficiencies, creative enablement, reduced cost and increased monetization.